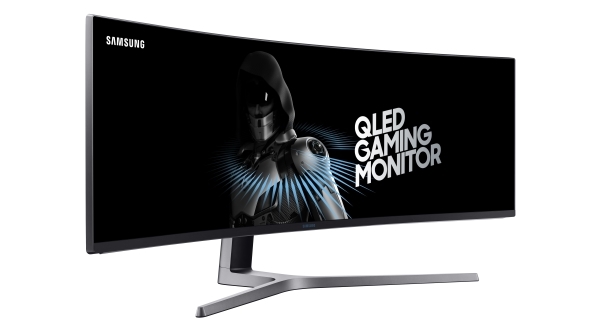 Update June 9, 2017: Samsung have unveiled the first AMD FreeSync 2 monitors, aiming to bring super-smooth HDR gaming to the Radeon faithful. That and warp the idea of what’s acceptable in the world of ultrawide monitors. G-Sync HDR and FreeSync 2 are about to go head-to-head, but these are the best gaming monitors for your eyeballs right now. 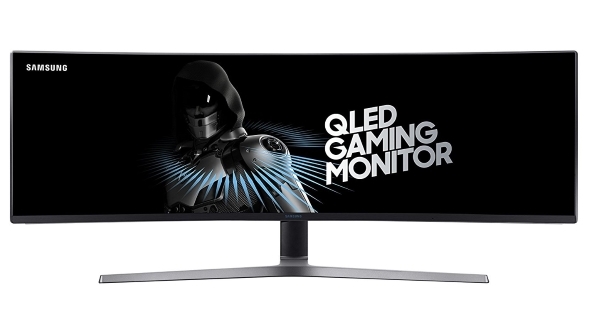 Hot on the pixels of Nvidia showing off a pair of ultrawide quantum dot G-Sync HDR panels at Computex last week, AMD and Samsung are hitting back with their inaugural FreeSync 2 monitors. We first heard about the new screens back in April but now they’re available for pre-order at Amazon or Newegg, with a June 30 release date. 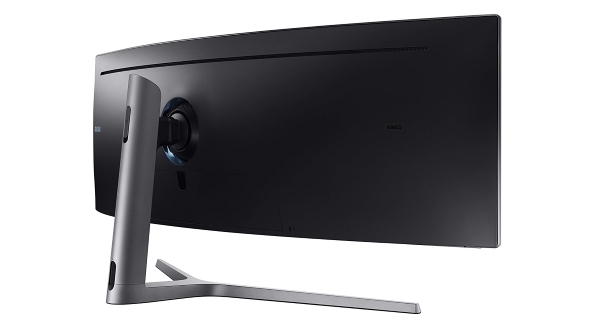 There are three new FreeSync 2 displays making up the new Samsung QLED range, with 27- and 32-inch versions of the 16:9 CHG70 and a 49-inch 32:9 ultrawide CHG90. Yeah, 32:9, an aspect ratio surely someone asked for. I’ve no idea who, or why, but Samsung must have some justification for it. Anyways, all three are using essentially the same VA panel tech, running at 144Hz with a 1ms response time. They’re also using a quantum dot filter over the panel to boost the colour gamut, which is what makes them ideal for the future of HDR gaming. That’s why Samsung are calling them QLED displays. The bizarro-world 49-incher is retailing for $1,499 and the more straight-laced 27- and 32-inch displays are $599 and $699 each. Original story January 3, 2017:AMD have just announced their new FreeSync 2 technology, allowing frame synchronisation to sit cheek by jowl with high quality HDR gaming. So long as you’ve got a compatible monitor, that is. And compatible GPU, driver, OS and application too. Quick refresher – FreeSync is AMD’s counter to Nvidia’s G-Sync and works with the open DisplayPort Adaptive-Sync standard, and doesn’t need expensive extra silicon jammed into compatible monitors either. They both essentially mean that the monitors and graphics cards talk to each other and come to an amicable agreement as to what refresh rate they should provide given the expected frame rate of a game. That eliminates tearing as well as the judder and input lag traditional V-Sync implementations can introduce to your gaming experience. 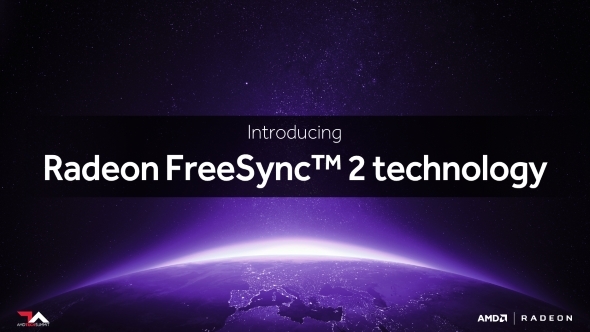 FreeSync 2 is designed to sit alongside the existing FreeSync tech and is primarily aiming to bring smooth playback to high dynamic range content. There are two key standards for HDR right now – HDR 10 (the one used by Amazon, Netflix and the BBC) and Dolby Vision – and both are set to broaden the colour palette and contrast levels on display across all our content. The increased colour depth and contrast offered by HDR work beautifully with a good TV and properly graded video, but for gaming things aren’t so cut and dried. Both the current standards have been designed with TV in mind where the chip inside them manages the increased load of HDR content on a TV’s silicon through a process called tone mapping. That’s fine for video but for for gaming the process can introduce a certain amount of input lag. AMD claim this can be as high as 100ms, and that increased input lag has no place in our games. FreeSync 2 though shifts the tone mapping load onto compatible Radeon GPUs essentially eradicating the extra time regular display tone mapping adds to a scene. 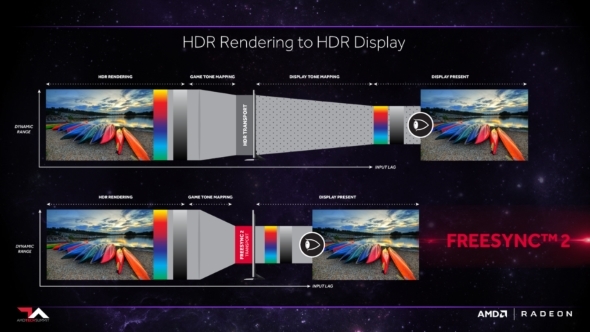 AMD have said they’re working with game devs to encourage them to use the FreeSync 2 API in their HDR-ready game engines and have also been working with display manufacturers to get screens out the door too. Though we’re going to have to wait a little while to see the full fruits of those labours. While you will need a new monitor, new drivers, OS support and specially-created HDR content, you might not need a new GPU. 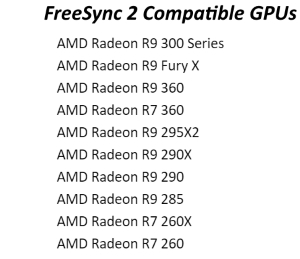 Any FreeSync-compatible AMD graphics card will all support FreeSync 2 when it launches in the first half of this year.